Association for the Protection of Syrian Archaeology shared images of the current state of the St. Simeon Monastery, part of the World Heritage Ancient Villages of Northern Syria, available here. Aleppo Archaeology shared images showing the damage to the Museum of Traditions in Old Aleppo, and another here, and images of the concrete reconstruction to Khan al-Saboun. According to the Authority of Tourism and Protection of Antiquities, looted artefacts were seized by Kurdish Security Forces (al Asayish) from traffickers in Manbej city. As part of the project initiated by the Directorate of Excavation and Archaeological Studies at the DGAM for the documentation of violations and illicit excavations in the archaeological sites in the Syrian governorates, the first statistics are available. There are of the damaged sites in Hama governorate, covering 76 of 122 archaeological sites, both registered and unregistered. The damage varied from bulldozing, to construction work to illicit excavation, which 21 sites have suffered from. More details are available here. Medmak shared a story from Alnashra website about a gang trading in Syrian artefacts in Lebanon. Lebanese Security Forces were able to arrest a woman from the gang. To read more on this story go here. Lexology’s overview of what constitutes “unlawfully exported cultural property” contains helpful information for the international art community to identify and deal with suspected trafficked items. Read the original Lexology article here. Stephanie Saldaña is a writer and teacher who is currently spearheading a Stephanie project called ‘Mosaic Stories’, seeking to protect the endangered heritage of refugees, especially those fleeing from the conflicts in Syria and Iraq. She has lived for many years in the Middle East and is passionate about the need to protect the cultures and languages that are disappearing as towns and villages across the region. In cooperation with the United Nations Development Program (UNDP), and the authorities in Homs province, and under the direct supervision of DGAM represented by Department of Antiquities in Homs, restoration work is being undertaken on the old Homs markets. Details of the work is available here. In Aleppo a large stud farm is being revived as many stallions lost their lives to the war and being sold on the black market. The Syrian embassy in Romania and Syrian Tourism Ministry have organized an exhibition featuring Syria’s culture and monuments. Read more on the Syria Times website here, and see the article from the SANA website here. Under the patronage of the Minister of Culture, the DGAM inaugurated the Exhibition Treasures of Syrian Heritage: “Rescue – Protection and Documentation” on 3/5/2017 in the Damascene Hall at the National Museum in Damascus. Photos are available on the DGAM website here. The Unit for Emergency Preparedness and Response at UNESCO has requested ICORP (International Committee on Risk Preparedness) to share good examples of disaster risk management plans for cultural properties (both immovable heritage as well as well movable heritage/museum collections) or of management plans of cultural heritage that integrate disaster risk concerns. This compilation of good practices is intended to provide technical backstopping to colleagues in UNESCO Field Offices, but also to Member States, on issues related to disaster risks reduction. These case studies can be developed with the agreement of the concerned authorities/authors with due acknowledgement. Out of these cases, the most appropriate examples would then be selected by UNESCO and possibly try to develop from these some sort of sheets according to an agreed format. In response to the damages in Syria and Iraq, a new coalition of ten countries has been formed to protect ancient heritage. The members include Iraq, Iran, Egypt, Greece, Italy, China, India, Bolivia, Mexico, and Peru. Read more on Art Net News here, and the Times of Israel website here. Turkey will repair 66 damaged mosques in Syria. Read the Daily Sabah article here. The Endangered Archaeology in the Middle East and North Africa Project have launched their database online – read more here on their website and at Heritage Daily here. Syria and Russia are due to start shooting a film entitled ‘Tadmour’ [Palmyra] by the end of this year. According to the Syrian Arab News Agency (SANA), the film is the first joint production between Syria and Russia and it will be screened by the end of 2019. Read more on the Syria Times website here. 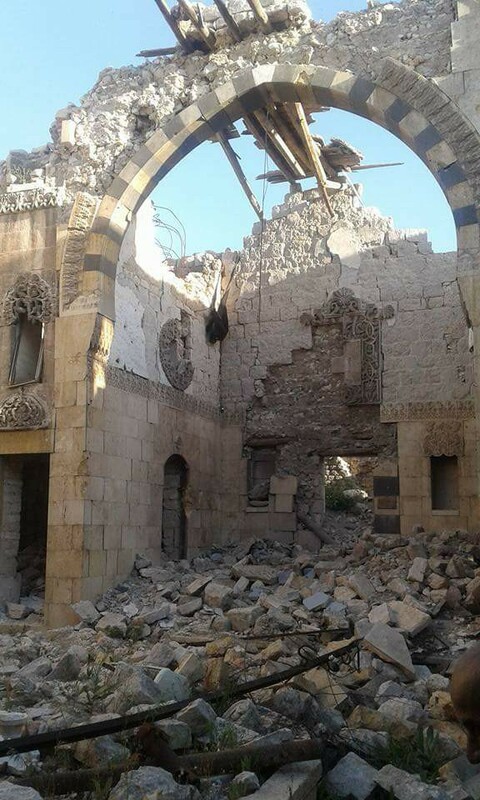 ASOR Cultural Heritage Initiative and The Day After Heritage Protection Initiative will begin repairs in Idlib Province this month. Read more here. The Aleppo Project is participating in #RethinkAleppo, an initiative and series of events on May 5 organized and hosted by Pakhuis De Zwijger Amsterdam and others. Participate or follow the livestreaming. Learn more on the Aleppo Project Facebook post here. You can read the report on their most recent reconstruction meeting here. The 2017 Creative Commons Global Summit included a seven-foot 3D replica of the Tetrapylon from Palmyra. Read more about it on the Tech Dirt website here, and the New Palmyra website here. H4P featured on Tv3 report on Syrian cultural heritage in conflict, (in Catalan), here. Devex talks with UNESCO Director-General Irina Bokova about preserving heritage and culture during times of conflict. See CNN and IWM’s coverage of photojournalist Sergey Ponomarev’s exhibition, “A Lens on Syria,” at the Imperial War Museum in London. ‘Hell on Earth,’ a new documentary about Syria, is now showing “at the Tribeca Film Festival through April 30 and will be broadcast on the National Geographic channel in June. Global Voices reports on international scholars searching for ways to protect Syria’s ancient heritage. Apollo Magazine asks Can museum security deal with terrorism, here. ISIS digging up past to finance terrorism, writes QCOnline. Architectural Digest reports on new technologies that can scan and render digital copies of historic buildings. High resolution cameras are also used to document ancient artefacts and transform them into digital assets. Read the original AD article here.